The Bannsiders held a two-goal advantage at the National Stadium via goals from Gareth McConaghie and Dean Shiels, but the Blues responded to mount a comeback and take all three points. Speaking to colerainefc.com, boss McAree was left frustrated with the Stripes’ performance after Dean Shiels’ strike. “The first goal we have got to defend the set piece better but in my opinion I don’t think it’s a free-kick. “I’d like to see it again but I think Stephen Lowry is hard done by. “In and around that stage there was a bit of pressure from Linfield fans directed at Shane and he’s given them a soft one but it is whatever way he sees it. “The third goal big G makes a great block but we don’t get close to Kyle McClean and that was a disappointment as we’ve spoken about when you make a clearance, that you also make ground with the ball. McAree highlighted Linfield’s experience of being in a similar situation as a major factor, but insists there were positives to take from the loss. 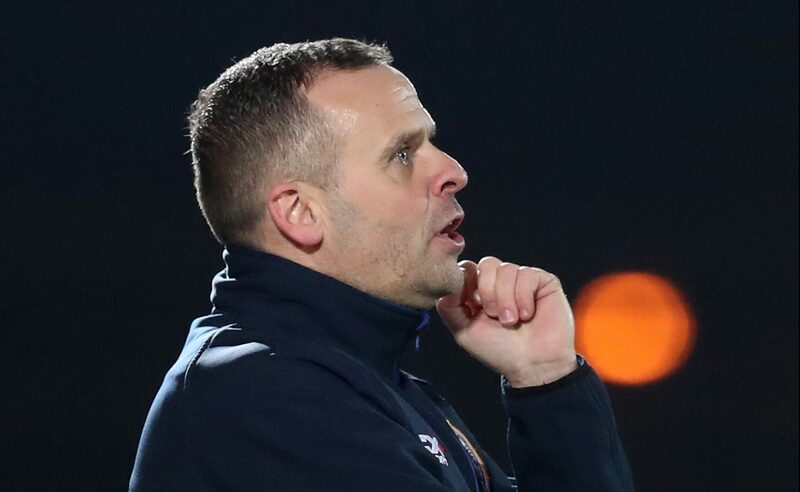 “It’s probably experience Linfield have gained from being in that position and driving themselves back into games,” he added. “You have got to give Linfield a lot of credit because they put us under a lot of pressure but individuals have to take responsibility and collectively we have to take responsibility when we are in this type of situation. “We’ve got to dig our way out of it, show a little bit more leadership, a little bit of drive, personnel maybe organising things a bit better. “It’s a difficult one to take. “There are definitely positives to take out of the game as I do believe Linfield will go on to win the league. “We’ve came here twice this season and we’ve done extremely well. The first game we won and today we are disappointed we didn’t take anything out of it. The Irish Cup holders also failed to take advantage of Crusaders’ defeat to Dungannon Swifts – much to McAree’s dismay. “Crusaders losing is a disappointment from our point of view as it would have been three points that we would have gained on them, or even a point,” he concluded. “It’s disappointing when you see that they’ve lost to Dungannon Swifts and you haven’t made ground on them. “We have to try and put that right next Friday. “We’ve got to learn from our mistakes and if we want to improve then they can’t happen again.